In many ways, Belize is a true melting pot of cultures. Although the nation is relatively small, occupying just under 9,000 square miles, Belize is home to a mixture of traditional Mayan people, those with roots in Garifuna heritage, Kriol residents, Mestizos and plenty of immigrants from China, Lebanon and India. Since Belize was under British rule until 1981, there are also plenty of colonial influences to add to the mix. As a result, Belize is unlike anywhere else on Earth. If you're fortunate enough to spend any amount of time in Belize, here are some of the best ways to explore the country's vibrant culture and rich heritage. Officially, the language of Belize is English, an obvious choice give that the country was once under British rule. However, that isn't the only tongue spoken in this unique destination. Since Belize shares borders with major Spanish speaking nations like Mexico and Guatemala, it shouldn't come as a surprise to earn that Spanish is also widely spoken within the borders. In addition, locals may speak Kriol or Garifuna languages. Learn a few words in Spanish to fit in with the locals, or say Gud Mawnin, which is Kriol for good morning, if you want to make a great impression. With a location right on the Caribbean Sea, Belize is home to some truly exceptional seafood. The long growing season and warm weather also means that fresh produce is available year round, contributing to the wonderful local cuisine. Visitors eager to experience the culture of Belize should definitely try as many authentic culinary specialties as possible while in the country. Breakfast might be a fry jack, or pancake, flour tortillas and cheese and tea with sweetened condensed milk. Heartier lunches and dinners can include rice cooked in coconut milk and peppers, an onion soup called escabeche and stewed chicken over rice. In some historically Mayan areas, you can still enjoy a roasted pig with locals on special occasions. After a day or two in Belize, you'll almost certainly hear some Punta music, which is an Afro-Caribbean genre popularized by the Garifuna in Belize. A mix of reggae and calypso, Punta is all about uptempo songs and dancing. If you get the chance, head to a local bar with live music and check out the local music scene. A great Punta band will have the crowd up and dancing to the beat in no time, giving you an excellent chance to mingle and get to know local residents. 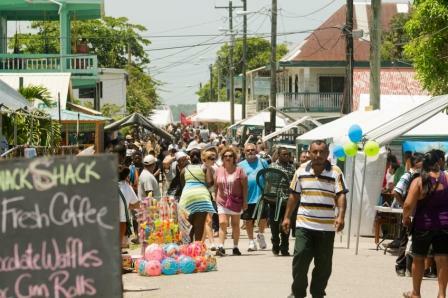 If you want to add some diversity to your time in Belize and see a different side of the country, then don't miss out on the chance to attend one of the many fascinating local events, celebrations and festivals. The San Pedro Carnival, for example, is a lighthearted celebration held on Ambergris Caye that boasts plenty of surprising customs and traditions. Commonwealth Day, held in May, celebrates the Queen's birthday and boasts races between bicycles, runners and even horses. All celebrations, whether religious or cultural, feature live music, dancing and plenty of incredible food. The culture of Belize is vibrant and unique. Make the most of this incredible opportunity by trying the local cuisine, listening to Punta music, attending a traditional festival and learning a few words of the local language. Learn more about visiting and living in Belize.